SUMMARY: Our research finds that 69% of B2B firms have established value propositions, which clearly communicate what your company does, and the unique benefits you have over the competition. In this week’s chart, see what 1,745 B2B marketers said were the most successful tactics for developing effective value propositions that resonate and convert. Q. Please select the top tactics for developing the most effective value proposition for your organization. MarketingSherpa is part of the MECLABS Group. MECLABS is a science lab that uses real-world research to help business leaders get better use out of sales and marketing technology and resources, including Internet marketing, website optimization, and lead generation and nurturing. As part of its expertise, MECLABS focuses on best practices for developing and optimizing value propositions, and has set the following criteria for success. A value proposition should define the key reason why your company is the best choice for your ideal customer. It should clearly communicate what your company does, and the unique benefits you have over the competition. Why should buyers who meet your ideal customer profile buy from you, and not one of your competitors? Most B2B organizations understand the importance of value propositions, and have defined them for one or more of their products or services — but are they following best practices for developing effective value propositions? To answer this, we have displayed the results in the above chart. 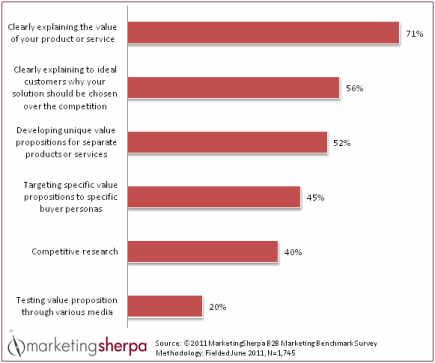 Coming in at the bottom of the list, with only 20% of respondents, is the best practice of testing value propositions through various media. Many organizations have defined value propositions, but this data indicates that organizations may not test them as often as they should. After all, how will you know if a value proposition is the most effective for your organization, if you don’t test it? 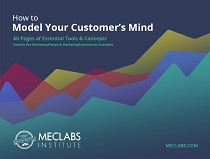 The list of most effective tactics includes MECLABS best practices – clearly explaining the value of your product or service, and clearly explaining to ideal customers why your solution should be chosen over the competition. By executing these top two tactics, organizations will answer the two key questions (mentioned above) in developing value propositions. Competitive research appears lower on the list, but is required to execute the second-most effective tactic. Organizations cannot really explain to ideal customers why their solution should be chosen over the competition without first conducting competitive research. For additional research data and insights about B2B marketing, download and read the free Executive Summary from the MarketingSherpa 2012 B2B Marketing Benchmark Report: Research and Insights on Attracting and Converting the Modern B2B Buyer.